In April 1967 the Battalion moved to Vietnam on board HMAS SYDNEY and relieved 5 RAR at Ap An Phu on the morning of the 26th April 1967. 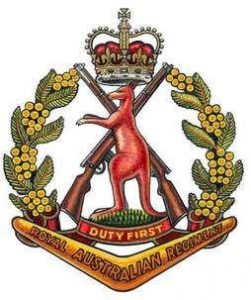 By the time 7 RAR departed for Vietnam it had developed a distinctive character forged in the isolation of Puckapunyal. Much of 7 RAR’s distinctiveness came from the high number of National Servicemen within the ranks. This situation not only brought the average age of the Battalion down to 22 years but also resulted in many platoons and sections being led by newly commissioned and newly promoted National Servicemen. During the following 12 months the unit was engaged in 30 Battalion sized or larger operations, had many contacts with the enemy and fought six major engagements. 7 RAR on the 4th August 1967 went on the offensive south west of Nui Dat with Operation Ballarat. The Battalion entered its area of operations (AO) on foot carrying five days rations. With stealth it caught the enemy by surprise and there were several contacts. One turned into a savage four hour battle between ‘A’ Company and the forward company and reconnaissance platoon of 3rd Battalion of 274th Viet Cong (VC) Regiment that was moving through the area. The Battle of Soui Chau Pha ended with six Australians killed and 19 wounded. 10 bodies of VC were recovered and it was estimated that a further 200 casualties had been caused to the VC Battalion under the weight of artillery, mortar and airstrikes. The Battalion’s first operational tour culminated with Operation Coburg in February/March 1968 when the enemy TET Offensive threatened the Bien Hoa complex. On 9th April 1968 7 RAR was relieved and then returned to Australia. During this tour 7 RAR had 16 members killed on active service. The Battalion advance party commenced the air move to Vietnam on 10th February, 1970. The main body embarked at Garden Island on HMAS SYDNEY on the morning of 16th February and disembarked at Vung Tau on 27th February moving by road to Nui Dat where the Battalion occupied the same sector it had done two years before. Operations commenced with Operation Finschafen on 9th March 1970 and continued with all or most of the Battalion involved in the field until Operation Phoi Hop which concluded on 21st February 1971. For the first four months operations were in depth away from populated areas and were mounted and controlled from a battalion fire patrol support base (FSPB). These operations were aimed at destroying the enemy in his base areas. After that, the Horseshoe feature, a few hundred metres north of the village of Dat Do, was occupied by Battalion Headquarters and up to three companies with artillery and armour. This base became the centre of operations for the remainder of the tour with emphasis moving to pacification. Rifle companies often established company sized bases known as Night Defensive Positions (NDP) from which ambushes and patrols were mounted. The last operation ‘Phoi Hop’ saw a return to depth deployments with sub units well to the north and north-east of Phouc Tuy Province border. The Battalion returned to Nui Dat on 21st February and embarked for Australia on HMAS SYDNEY at Vung Tau on 25th February 1971. Sixteen members had been killed in action, 89 wounded and there was a medical death on operations. 7 RAR was linked with 5 RAR at Tobruk Lines, Holsworthy on 3rd December 1973 to form 5/7 RAR.